Second only to the hybrid tea in popularity, Floribunda roses bear flowers in large clusters, providing massive, colourful, long-lasting garden displays. As a class, they are hardier, easier to care for than their hybrid tea counterparts. They range from low growing varieties of 50cm high, but average at 1.2m. Well suited for use en masse, in pots or to form attractive borders and low hedges. Height indicates width. Plant approx. 50cm to 1m apart. (Meipeporia) - A wonderfully attractive, compact shrub rose producing continuous trusses of luminous..
(DICkylie) - A striking novelty rose of pink and white stripes. The semi-double blooms are continuou..
(Swim & Weeks) - Fragrant deep mauve double flowers with wavy petals. Strong upright bush. 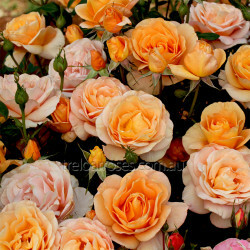 Dark gree..
(Boerner) - Buff apricot in colour plus strong healthy growth make this rose a must for the rose gar..
(KORorbe) - Abundant, deep apricot-yellow bud, changing to apricot pink as the flower develops. The ..
(Basgoodas) - A beautiful, repeat flowering rose of deep pink and blackberry with a strong fragrance..
(Taniripsa) - A lovely floribunda suitable for landscaping and mass planting, with flowers and folia.. The beautiful, dainty pink blooms grow in large clusters continuously throughout the growing season,..
(Korbehati) - An abundance of fully double blooms open to large cups in a very attractive apricot. U..
(Proberg) - A sport of Iceberg, "Blushing" Pink Iceberg is identical in every way except for the del..
(Meilland) - Darker sport of the ever popular Seduction. Exquisite petals of deep sunset pink and iv..
(Meidomonac) - Shrub-type rose with masses of soft pink double blooms. Easy to grow, disease resista..
(Jaccofl) - Clusters of fragrant apricot blooms with a yellow reverse, repeat freely throughout the ..